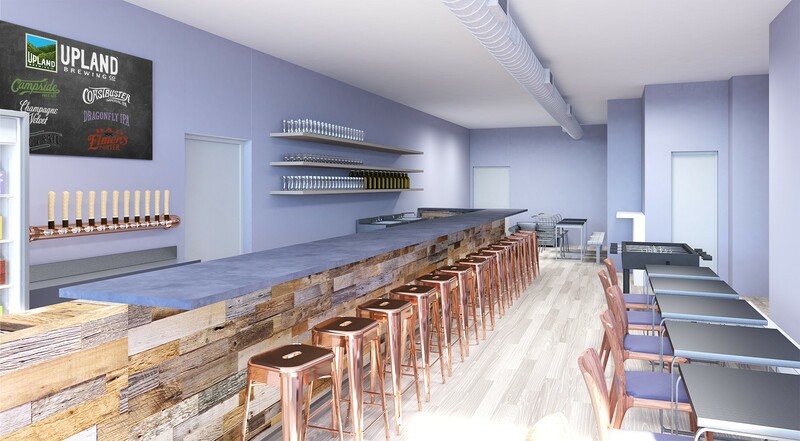 College Ave. Tasting Room Renovations - Upland Brewing Co.
We’re excited to announce renovation details for our College Ave. Tasting Room slated to start Monday, July 16th and tentatively looking to reopen to the public on Tuesday, July 24th. The renovation will create an open concept layout, expand draft & carryout beer selections and provide space for more event programming. The Tasting Room on College Ave. opened its doors in November 2009 as our first location outside of Bloomington, Indiana. The tasting room has been known to locals as a charming dog-friendly spot to enjoy a pint alongside friends. The new space will maintain its original charm and dog-friendly nature with a more modern design and feel. The bar will be lengthened and reorientated in order to provide faster service as the draft lines increase from six to ten. Two of the new draft lines will be dedicated to our growing line of award-winning sour ales. The carryout selection will be expanded to offer the full lineup of Upland beers. The new open concept space will also enable expanded event programming including sour ale tastings and educational events. We are thankful for the longtime support that the community has shown us since 2009 and look forward to serving its members for years to come. This year marks the 20th anniversary of Upland Brewing Co, and these renovations highlight our commitment to creating a great experience for its customers for the next 20 years and beyond.